The Chicago Athletic Association has such a rich cluster of bars that one could easily spend a whole night bar-crawling through the hotel. Rooftop bar Cindy's is where you go for views, the elegant Cherry Circle Room for throwback cocktails, the boisterous Game Room for classics and frozen drinks, and the relaxed Drawing Room for an old-fashioned by the fire. The final piece is Milk Room, the smallest (and most expensive) bar, which opened in mid-November with just eight seats and an inventory of rare and vintage spirits. Milk Room is located in the hallway between the Drawing Room and Game Room in what was once a speakeasy, and the space feels like drinking in an old monastery—flickering candles line the walls, the doors feature stained glass castles and ships, and electric candles in iron light fixtures hang from the beamed ceiling. A ham sits at one end of the copper bar, and most people were ordering plates of sliced ham with a baguette, butter and radishes (you're going to want something in your stomach before you start drinking). It may be tiny, but getting in is straightforward—eight seats are available in two-hour blocks throughout the night. Though tickets are sold online via Tock, two seats are left for walk-ins, if you'd prefer to make a spur of the moment visit. The online tickets are $50 per person, and that cost is applied to your bill at the end of the night. Paul McGee is the beverage director for all the CAA bars minus Cindy's, so he's involved in Milk Room, but most nights, you'll find Stephen Andrews (of Billy Sunday, which has its own impressive selection of vintage spirits), who is there five nights a week, while Julia McKinley and Julia Gordon, both of Lost Lake, handle the other two. The night began when Andrews handed me and my date miniature champagne cocktails, which were just the right size to sip while perusing the menu. 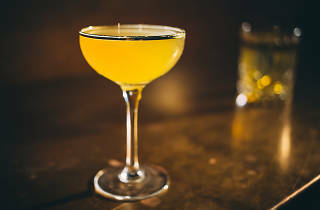 It's an imposing menu, too—it opens with eight cocktails, which range in price from $18 to $50, then lists spirits that you can get poured straight or in a cocktail. We started with cocktails—I immediately blew my $50 deposit on a Bobby Burns, made with Glen Grant, a 15-year Speyside Scotch, Cocchi di Torino vermouth, Benedictine from the 1950s and Angostura bitters. The drink was perfectly balanced, and Andrews served a taste of the 1950s Benedictine alongside it. The Benedictine, which Andrews said was made with macerated herbs versus today's speedier extraction process, also became much drier as it aged, and tasting the spirit against the cocktail helped me pick out the herbal notes. My date ordered the Toronto, a $28 drink made with Pikesville Rye, demerara and Fernet Branca from 1957. Tasting the vintage Fernet was fascinating—it's substantially different from the current version, since the sugar and menthol drop out and it's much drier, almost leathery in taste. It made a terrific Toronto. Both cocktails were excellent, but once we finished them, things really got fun. We studied the menu, but more readily available spirits, like Letherbee Gin, are listed alongside rare and vintage ones, so it can be hard to know what to get. So we just started asking questions. I didn't see an amaro section on the menu, so Andrews brought out Zucca from the 1950s, which was more oxidized than the current version we tasted it against. I asked about Andrews' favorite bottle, and he pulled out Amer Picon from the 1940s. We tried 1970s Old Forester bourbon, which has been hanging out in Japan for the past few decades (many of the vintage spirits are sourced from Italy and Japan). But perhaps the best thing we had was Legend of Cuban Rum Pre-1962. Distilled in Cuba in the early 1940s, the rum was shipped to Spain, where it was stored in oak casks that previously held oloroso sherry. We sipped it straight, and it's a marvelous, richly flavored rum, which Andrews also made into a daiquiri. Many of the tastes are tiny pours that are included in the price, which helped me find value in the final price tag. It's hard not to compare Milk Room to the Office, the bar underneath the Aviary, so I will. The Office has more seats and focuses on house-made ingredients and unexpected combinations of flavors. But the experience feels similar, as both offer immense personal attention, which helps you feel like you really understand the drinks. 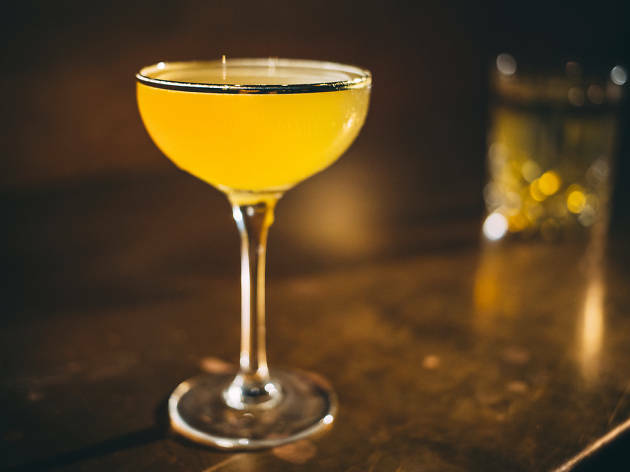 Milk Room isn't the only place to find vintage spirits in Chicago—the Office has quite a few, and Billy Sunday also has an excellent selection, which are showcased on the Chosen Ones section of the menu—though they're focused more heavily on using them. The cocktails are impeccable and service is warm and incredibly knowledgeable, though there are a couple flaws with the space. While the uncomfortable chairs are going to be replaced soon, the bar's location near the Game Room meant it was noisy, so it isn't the relaxing experience you want when drinking pricey cocktails, at least on Saturday night. And the lighting is so dim we were handed flashlights—seeing the crumbling labels on bottles adds to the experience, and turning up the lights a bit would be helpful. While I was writing this, a coworker asked if Milk Room is the best bar in the Athletic Association. That completely depends on what you want—it's hard not to be impressed with a rum made in Cuba before Fidel Castro, when my parents were not even born and my grandfather was in World War II. It's also hard not to be impressed with how good the drinks are. But when the prices are so high, you have to ask—are these drinks better than versions made without vintage spirits? Not necessarily—my favorite Bobby Burns in town is at Travelle, where it's made tableside and costs $30 (still pricey, I know), and Intro currently has a wonderful version that's $16 (ditto). But the vintage Fernet used in the Toronto is so changed, it tastes like it's a different cocktail. Andrews agreed that not everything vintage is automatically worth drinking—he showed us a bottle of decades-old CAA-branded Scotch that was found during the restoration but said it wasn't good. It's also possible to do Milk Room for less—walk in and order the $18 daiquiri or $26 Bijou, then leave after one drink. It's still an experience, then you can go have $13 drinks at Cherry Circle Room or $8–$12 cocktails at Game Room, and McGee also does the menus for those bars. As for me, I won't stop having cocktails at the other bars (seriously, you can't keep me away from the CAA), but I'll sure as heck go back to Milk Room when I have the chance. Amy is the Restaurant and Bars editor at Time Out Chicago. If you are what you eat, she’s definitely an ice cream cone. Follow her on Twitter @AmyCavanaugh.